Although Madondo immediately recognises the absurdity of the position he has just taken, he, for some unfathomable reason, can’t quite bring himself to say so in his column. “The only black names are those he believes validate his elitist view of the parallels between jazz and elevated taste. There’s also almost no discernible attempt to deal with India (apart, of course, from the token essay on Nirad Chaudhuri), South America or any other Third World country. Let’s just assume it’s not racism, that a man who writes with such aching clarity and feeling can’t be racist. Let’s just assume James’s primary focus is writing about his childhood heroes. Looking at the recent post list, I am begining to think we should rename the forum the "Clive James Forum"
That's true Bogus Trumper. Let's get back to talking a bit more about Pete (wish someone would give him some kind of award!) Clive's words are wonderful, but the music is pretty brilliant too. To reply to Kevin's last message - sorry if the thread was cut off somewhat. My thoughts on reading the South African cultural commentator's review was that poor Clive was damned if he did, damned if he didn't . If he had included anything about Africa it would have probably have been dismissed as "token"! "Cultural Amnesia" is definitely going on my wish-list. Please could someone give an update on Clive's doings? I know its cheeky to ask, but could Kevin post a weekly link to his blog if there's some new material on Mr James? Clive does seem to have been pretty busy in Australia over the last few weeks, there's been at least one good interview, a collection of his writings... and isn't there a poetry book due in the near future? CJ's work has stimulated some interesting discussion on MV in the past and it would be a shame to lose that aspect of the forum. I have absolutely no objection to CJ threads and posts! It was just that we seemed to have stopped having any PA threads and posts for a while! Was given "Cultural Amnesia" for Xmas. Ploughed happily through it for several months, struggling hard to keep head above water. Was amazed at his cultural range - how many creators/critics are so at ease with so many modern european writers? And in the original languages? And some are now griping that he doesn't encompass all the world's cultures? C'mon, guys - let's get serious. He does what he does better than most/any of his generation - don't expect him to be a modern incarnation of 16th century savants who could encompass all of human civilisation. And as for that Pete Atkin..... Well, love him to bits, but his best stuff was in the '70s. His restatements of the canon are spotty - some an improvement, but others made me dive back to the originals. Still, I'll forgive him much for his efforts over the years (not sure about the Shrinks though, even if they do have my money). Will give them another go in the car on the way to a conference in The Hague on Thursday. 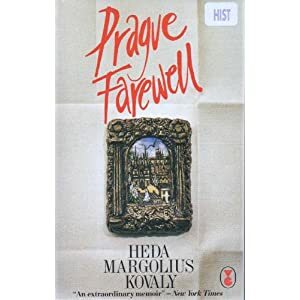 The Czechoslovakian writer Heda Margolius Kovály, who died of the 5th of December and whose obituary, written by her son, Ivan Margolius, appears in today's edition of The Guardian, was much admired for her account of life under the Nazis and Communist regimes, Prague Farewell. Possibly better known, and up until recently more readily avaliable to, English readers under the Under A Cruel Star: A Life in Prague 1941-1968, this book has had its admirers ever since it was first published, with some influential critics suggesting that it's a classic which ranks alongside works of Primo Levi as as an account of the war and its aftermath. “Given 30 seconds to recommend a single book that might start a serious student on the hard road to understanding the political tragedies of the 20th century, I would choose this one."